Produced by GLOBE VIDEO FILMS and released September 2002. As a tribute to this fast disappearing type we present our long await 3rd in the series of Class 47 videos following our earlier productions TOUGH ACT TO FOLLOW and VISIONS OF POWER. 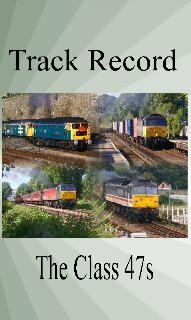 In TRACK RECORD the emphasis is on cross-country services leading up to and including the historic scenes at Penzance in August 2002 with the departure of the last scheduled Class 47 hauled service for Virgin Cross Country. However, this programme has much more, ranging from Edinburgh-Glasgow push-pull services to NSE workings on the Waterloo route; from VSOE services in the North of Scotland to clay trains in the South West of England, and from enthusiasts railtours to passenger drags off electrified lines. Just a small sample of the locations that feature are Newquay, Poole, Honiton, Salisbury, Dover, Swansea, Boston, Abergele, Birmingham, Liverpool, Manchester, Garsdale, Doncaster, York, Glasgow Queen Street, Aberdeen and many, many more. Included are several views of each of the celebrity repaints, some on their first outing and the number of liveries included in this programme is almost too numerous to mention. Not only this, but we have included an archive section showing rare footage of the Class in the early 1970s with views of Reading, Bristol, Birmingham New Street Crewe, Shrewsbury and other locations. See Vulcan, Atlas, Colossus and Amazon as they used to be. See two-tone green 47s at work and locos in pre-TOPS guise. Grab yourself a piece of history.